Somedays are just designed special. It was one of those memorable days for us. Our conference day one had gone well, our session was well received and there was a new victory. 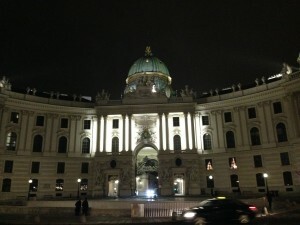 And we decided to venture out in the evening and enjoy fresh air and explore Vienna city. It would be very cruel to be in Vienna for three days and be pigeon-holed in a hotel. Little we knew that the day was going to get even better ! People of Vienna are very friendly and hospitable with genuine warmth. When we requested suggestions for the evening, we got nice feedback. A new friend we made at the conference was even more kind and gracious – Ms Britta S. She not only recommended us a few restaurants and places to visit, she actually accompanied us and guided us through the city’s District 1. We did not want to steal her personal time but she wanted us to see real Vienna and accompanied us. And this has actually been the hallmark of the Vienna Trip. People have been very wonderful in Vienna. We got help and assistance from everyone. People actually took efforts to help us. We wanted to buy local SIM and we got it from a local shopkeeper. He did not charge us for the SIM. Now many retailers receive free SIM but people never miss a chance to charge for it – especially to tourists. I had a small issue with my new shoe and a store manager at a top notch shoe retailer helped us fix it. She really wanted to help us and went out of her way. People helped us airports, hotel and city centre. Our first stop on a wonderful evening in Vienna was a Persian Vegetarian joint called Kardamom. The owner was a Persian lady and she made the food from best local vegetables and she actually flew spices from her mother’s garden. We were happy to visit this place – as we entered the joint, she recognized our friend. She asked whether we would enjoy Vegetarian as she does not serve non-Veg. We were like – enjoy Vegetarian? We only eat VEg. We are more than delighted to visit this Pure Veg and highly recommended restaurant. We started our evening with a refreshing mint-ginger-lime cooler. It was followed by a wonderful Pumpkin soup. I had eggplant and hummus while my colleague had fresh salads, beans and vegetables with yogurt. Our friend had veggie patties and Persian rice. The food was wonderful and we were delighted after a lunch of soups and soups only ! After a wonderful dinner, we decided to walk around the First District. We saw the St Stephen’s Cathedral – it was majestic. There is something about these vintage and spiritual places – there is always so much peace and positive energy. The live piano music added to the charm of the place. After that we went to local chocolate and pastry shops. We bought the wafers from Vienna’s sweetest corner – Wanner. We visited the Castle. It was indeed magnificent. Vienna was founded by Romans and the excavations of the central garrison of Roman period are still for people to view. On the way, we saw a monument dedicated to people who died in the great plague – Pestsaule. The noteworthy city memorial remembered the 76000 victims of the plague. But we wondered why was the memorial in total gold? The city’s town centre was very spacious – it indeed lookec like a city of royals and emperors. The city centre is now a UNESCO World Heritage site. The First District was truly royal. It was very grand as compared to London. The small streets present a beautiful charm. The palatial structures along the spacious big streets reminded us of a royal heritage. The evening was little cold but pleasant and shops had wonderful lights and best displays. We were enjoying our walking and nice conversations. We visited Cafe Central – It was established in 1876 and had a very classic and vintage look. During summer days, people had to really book well in advance. Lot of people come and enjoy their coffee and reading. People can pick up magazines and newspapers and enjoy reading while drinking coffee. They can spend an entire day with one coffee – nobody asks questions! 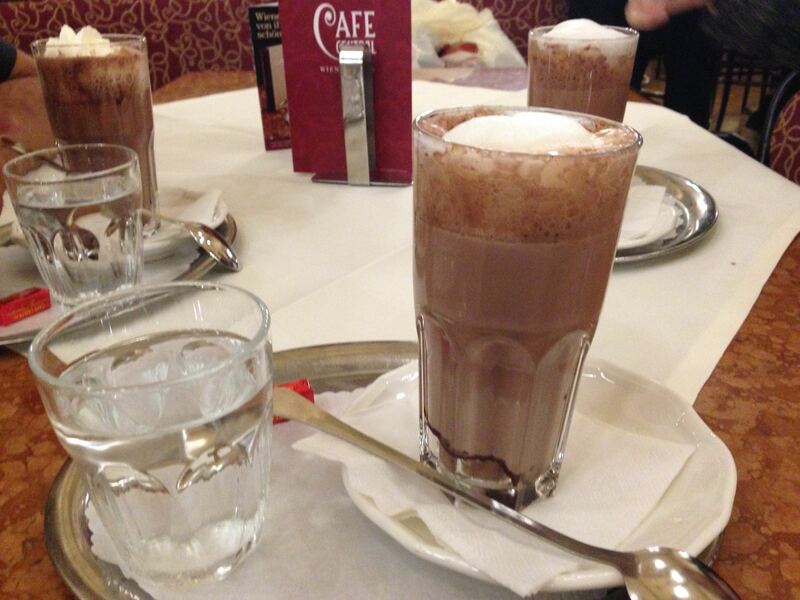 This is another speciality of Vienna – Its famous coffee culture. One can find many traditional coffee joints – such a break from Starbucks, Costa and Cafe Coffee Day world ! These coffee joints serve as an ideal place to catch-up with friends, read a newspaper or just enjoy the lovely coffee. And coffee is always served with a glass of water – which is either charged or has to be requested for in other cities. The coffee culture in Vienna was discovered accidentally. After the Turkish War, Turks abandoned hundreds of sacks of coffee beans. It were the Allies that helped Austrians discover the powers of Coffee. The Turkish war was driven at the behest of the Queen in Turkey who wanted her silks and shopping to reach her quickly via the silk route – women inspiration ! Our current joy land Cafe Central was patronized by Royal Family as well. We were happy to be there. It had some of the best desserts. We ordered Hot Chocolate and it was served with a special chocolate and water. I had one very special Chocolate called Chestnut Chocolate and it was indeed very different and exotic. The attendant was very thoughtful and he gave us some more almond chocolates as souvenirs of Cafe Central. We ended the day with a stroll along the river Danube. It was a nice and pleasant walk. We watched the traffic drive by in the adjoining 10 lane roads. We saw trams on one side and boats in the river. We saw people walking with us. We saw people running. We saw people sitting on benches and talking. We saw people with pets. It was relaxing for everyone – and that relaxed us. We were at peace and we were experiencing immense happiness. Vienna was tranquil. Vienna was amazingly cajoling! 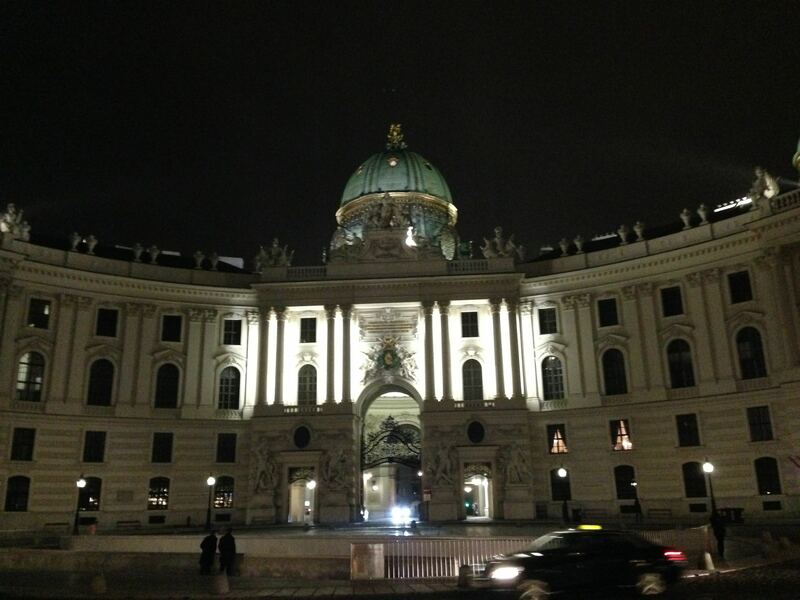 We were really loving Vienna and the wonderful evening. We have visited many cities but this city made an impact. Vienna has a population of just 1.7 million people ! Vienna has been chosen as the World’s Most Livable City for 5 times – amongst 200+ global cities. An achievement indeed ! About 30% of people in Vienna say they have no religion – significant indeed. Though my friends told that this might be to avoid payment of certain fees to Government. Every person entering Vienna (other than tourist) has to register with Government. Vienna has something for everything. Royalty, Palaces, Music, Museums, Gardens, Opera, Night Life, World’s First Zoo ! Vienna has a museum for coffins and mortuary science. Its central cemetery is very famous as well. Of course, music is one of Vienna’s legacies. Musical prodigies including Mozart, Haydn, Beethoven and many others were born or worked in Vienna. The next day, we had lunch at Vegetasia. Very good vegetarian only restaurant – serving Asian food. Not very expensive as well. Good ambience, nice buffet spread and nice service as well. We saw nice soups, good collection of desserts, curries. We also saw Indian samosas! Indeed, Vienna is a one lovely place to visit. Place with royalty, charm and lot of avenues for happiness. A place waiting to be discovered – again and again!